Dr. Douglas and Dr. Gallus discuss body contouring after weight loss and how it can improve the way you look and feel. Get your body back after weight loss or pregnancy. Hi, I’m Dr. Katerina Gallus with Restore SD Plastic Surgery. I’m joined by my partner. . .
To talk to you today about body contouring after weight loss. There are two main categories for weight loss patients. There are patients who have had bariatric surgery and lost a massive amount of weight. The American Society of Plastic Surgery recommends being at least 18 months out from surgery and being at a stable weight for four to six months, with medical conditions being monitored, resolved, and controlled prior to having surgery. The other group are patients who have been fortunate enough to lose significant weight with diet and exercise alone. For those patients, a stable weight for four to six months is required. The procedures that are offered after massive weight loss are varied. They include tummy tuck, breast lift with or without augmentation, arm lift, thigh lift, and lower body lift. Facial rejuvenation procedures may also be indicated. At Restore SD Plastic Surgery, we’re Board Certified experts in body contouring and perform all of our procedures at accredited facilities. 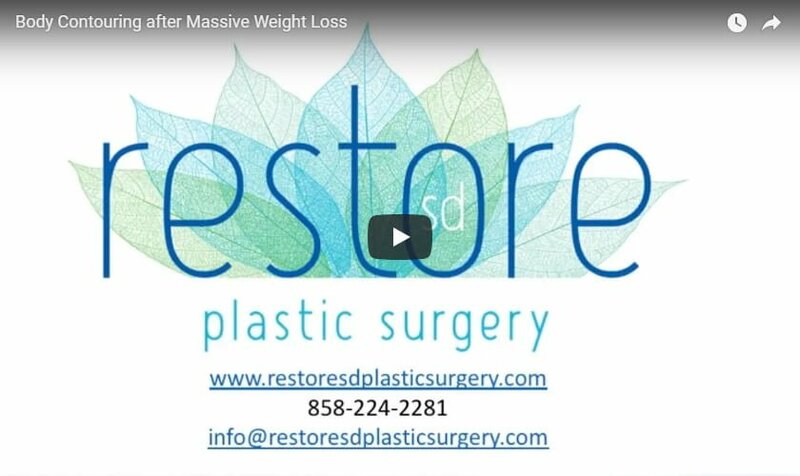 We look forward to seeing you at Restore SD Plastic Surgery to discuss your upcoming surgery.